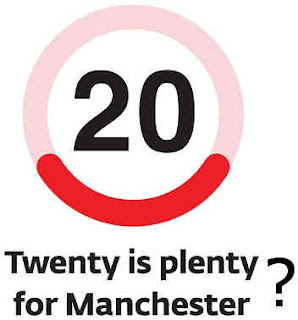 An evaluation of 20mph (30km/h) zones in Manchester has recommended that the City Council should for the time being focus on alternative road safety schemes because the zones have had little positive effect on speed, collisions and casualties. The evaluation found that the 20mph zones have only led to an average speed reduction of 0.7mph, and the ‘amount of accidents experienced in 20mph zones has not fallen as quickly as initially hoped’. The report also reveals that the number of cyclists and pedestrians casualties in three 20mph zones (Gorton, Miles Platting and Newton Heath, and Moss Side and Fallowfield) have fallen by less than the city’s average. If this evidence is supported with any other study, it could be the case of leaving the current 30mph (50km/h) limit and trust in driverless cars.